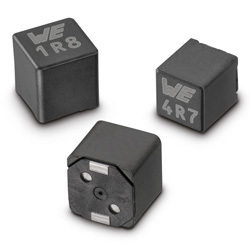 Würth Elektronik eiSos has expanded its portfolio of AEC-Q-qualified products with a high current inductor. The patented ferrite core design of the new power choke has an air gap optimally centred to secure a precisely defined saturation current. The WE-CHSA can be used in the extended temperature range of -55C up to +150C. The patented product design with air gap allows remarkably high saturation currents up to 54A. The magnetically shielded package of the device ensures a low stray field and the embedded solder pads provide optimal coplanarity while enabling good AOL capability. The rated current of the power choke extends to 28A. The product is offered in package sizes of 8mm x 8mm x 9mm, 10mm x 10mm x 11mm and 12mm x 12mm x 12 mm. For a rapid development phase, the entire series is offered in a Design Kit. The device is ideal for applications in the automotive industry, such as in powertrain control devices, infotainment systems or high current application for eMobility.